Hieronder volgt een greep uit de activiteiten van de internationale Pugwash beweging, zoals verschenen in het quarterly report van 1 september 2010. 2-3 July 2010. Beit Oren, Israel. Pugwash Workshop on Middle Eastern Security and WMD in the Middle East, co-sponsored with the Israeli Academy of Sciences, in cooperation with the Tel Aviv University’s Center for Iranian Studies and Israeli Pugwash, this meeting engaged approximately 30 current and former policy makers and experts in dialogue on regional security issues and weapons of mass destruction. 6 June 2010. Peshawar, Pakistan. Informal consultation on future security architecture in Afghanistan. 2-5 June 2010. Islamabad. Pugwash convened the first of a planned series of meetings of a new bilateral Pugwash India-Pakistan Independent Commission (PIPIC) to discuss ways to promote greater security for both countries through increased cooperation in several key areas. The 21 participants from India and Pakistan included prominent current and former policy makers, diplomats, military and intelligence experts, and media analysts, who brought to the table a wide range of experience and insights. Participants were hosted by the UK High Commissioner Adam Thomson for a special reception and dinner. Funding was provided by the US Institute of Peace and by Vertic. 15 May 2010. New York City. Pugwash NPT Consultation on Nuclear Weapons and WMD in the Middle East. On 15 May 2010, Pugwash convened a private consultation in New York City, involving 16 current and former diplomats, UN officials and leading NGO experts from 10 countries for a general exchange of views on issues related to the current NPT Review Conference and options for promoting progress on the 1995 Middle East resolution. 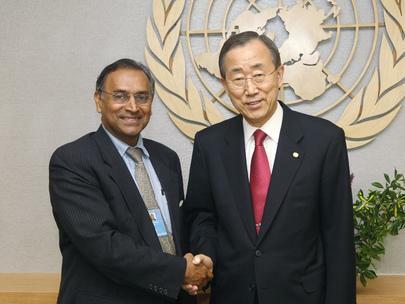 Pugwash president Jayantha Dhanapala met VN secretaris generaal Ban Ki-moon in New York. May 2010. New York City. Pugwash Consultation on the NPT. Pugwash convened a private consultation involving 20 current and former diplomats, UN officials and leading NGO experts from 15 countries for a general exchange of views on issues related to the current Review Conference. May 2010. Pugwash Proposal at the NPT Review Conference on the Concept of a Middle East WMD-Free Zone. This and related activities helped to influence the Final Document. May 2010. Pugwash published a briefing book for delegates at the NPT Review Conference, “Perspectives for Progress: The 2010 NPT Review Conference and Beyond, May 2010.” This briefing book includes short, action-oriented contributions from many Pugwashites from around the world. This 117 page booklet is available online. 30 April 2010: Ramallah (Palestine), Informal Consultation on Inter-Palestinian Reconciliation. 24 – 28 April 2010. Moscow. Pugwash facilitated a delegation of former senior European ministers (led by the Rt. Hon. Des Browne) who visited Moscow to discuss European Security, the New START treaty, and other timely issues with Russian policy makers and experts. This project on “New Nuclear Reality” was organized by the Pugwash Conferences on Science and World Affairs, Russian Pugwash Committee, Center for Euro-Atlantic Security of the MGIMO University, Russian Political Science Association, and the Friedrich Ebert Foundation in Russia. We also would like to acknowledge the support of Connect US and the Ploughshares Fund who made this and related work possible. March 2010. Pugwash published the “Composite Report of Pugwash Consultations on Pakistan, June – October 2009.” The report was drafted by Moeed Yusuf, Sandra Butcher, and Paolo Cotta Ramusino. It summarizes the findings of a series of consultations in Pakistan and Washington, DC, designed to increase understanding between the two countries on issues central to their ongoing relationship. 1-4 March 2010, Washington, DC. Pugwash facilitated a delegation of former senior European ministers, led by Des Browne MP, to discuss European attitudes to nuclear arms and disarmament policy with the Obama administration and key experts. A report also appeared in the New Atlanticist blog. 29 January 2010. Pugwash releases the “Milan Document on Nuclear Disarmament and Non-Proliferation” issued following the Pugwash NPT Roundtable Discussion in Milan. This document highlighted specific points relevant to progress at the May 2010 NPT Review Conference. It is also available in Arabic and Farsi. The Milan meeting engaged senior current and former policy makers from around the world in discussion of issues related to the NPT Review Conference. 13 January 2010. House of Commons, London. Roundtable on Nuclear Weapons Policies and the NATO Strategic Concept Review, co-hosted by Des Browne, convener of the Top Level Group, and Paolo Cotta-Ramusino, Secretary General of the Pugwash Conferences. Strong concerns were raised that the process of consultation on the NATO Strategic Concept Review is not providing opportunity for adequate political and public input. The report was mentioned in an influential UK blog, Left Foot Forward. 4-6 December 2009. Geneva, Switzerland. 30th Workshop of the Pugwash Study Group on the Implementation of the Chemical and Biological Weapons Conventions: Preparing for the Seventh BWC Review Conference. Organized with the Association Suisse de Pugwash (ASP) and the Geneva International Peace Research Institute (GIPRI), with the continuing support of the Swiss Federal Government. 12 October 2009. New York. Pugwash Consultation on CTBT Entry Into Force, with a special focus on engaging Annex 2 countries. 6 October 2009. London. Private Consultation on Issues Related to the NPT with a Special Focus on the Middle East, hosted by Rt. Hon. Des Browne MP in the Houses of Parliament, this meeting involved approximately 30 leading current and former policy makers and experts.